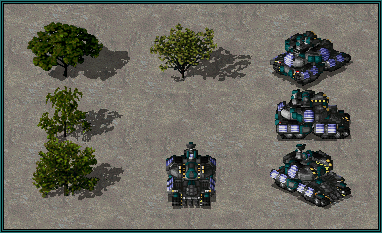 This unit requires infiltration of an enemy Tech Center and ConYard to be built. 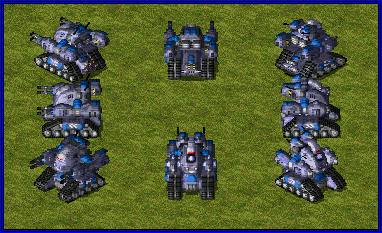 With limited funding and delays caused by various unexpected events, the development of the next-gen chrono tank, similar to the one designed during the Second Great War, did not go for the Allies as well as expected. 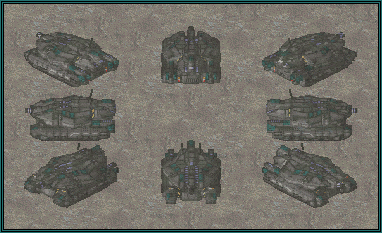 With most resources being allocated to the Paradox Project, it seemed the new tank, capable of chronoshifting anywhere on the battlefield without the use of the primary Chronosphere device, would not appear in the Allied arsenal too soon. The new war against Yuri resulted in interesting developments however, as the Paradox Project was completed prematurely and so attention was given to the tank again. The Quickshifter is the direct successor to the Chrono Tank. With the advanced 'Phalanx' Guided Missile Battery designed after the powerful weapon of the Aegis Cruiser and with additional ground targeting system, the Quickshifter becomes a dangerous force to be reckoned with. To make it even more terrifying, it has a single passenger slot. The passenger cannot leave until the vehicle has fully chronoshifted in. Passengers can't exit before the unit has fully chronoshifted itself. This unit requires infiltration of an enemy Soviet Lab and ConYard to be built. The Lionheart is a unique aircraft in the Allied air force as, instead of missiles, it relies on simple but effective fuel bombs with an additional electromagnetic pulse warhead that was seized from Soviet labs during the war. Whatever the Lionheart does not kill it will at least immobilize for a good while. 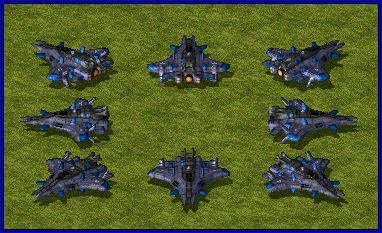 This combo makes the Lionheart Bomber a very effective unit destroyer that will quickly help you blow enemy armored battalions and infantry squads to smithereens. 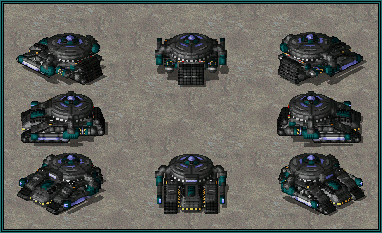 This unit requires infiltration of an enemy Pandora Hub and ConYard to be built. Only a select few at the top of the Allied research division and Siegfried himself know exactly how the Chrono Prison works. 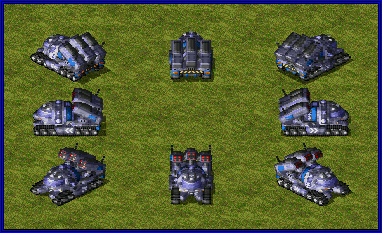 It is said that this unit uses advanced chrono technology to chronoshift enemy vehicles away into a distant unknown location where the driver of the abducted unit is either brainwashed into obedience or completely replaced before sending the unit back, ready to fight for the Chrono Prison's owner. 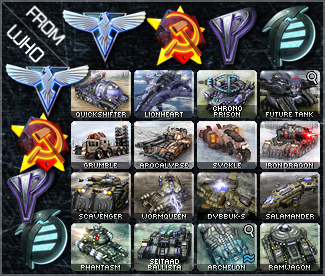 Some say that the Chrono Prison moves the vehicles into an alternate dimension where techniques as vile as Yuri's mind control are used to make it fight for the Allied side, but unless you become the victim of the Chrono Prison you may never know..
Has 9 passenger slots but only for captured units. 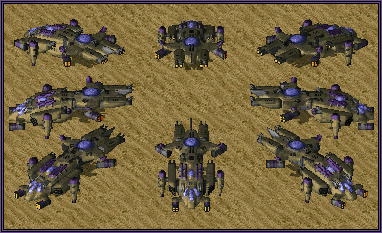 This unit requires infiltration of an enemy Cloud Piercer and ConYard to be built. After losing the blueprints and prototypes of the Future Tank X-0 during the Okawa Falls incident, Kanegawa Industries continued their work on a fully automated battle tank in several locations around Japan which had not yet been stormed by the Chinese forces. However, even the remaining facilities were eventually forced to shut down, as the Soviets won the war and China took control of the remaining Seismic Stabilizers in the country. The executives of KI decided to cease their plans for mass production of the then proposed X-1 prototype and destroy all data related to the vehicle when they realized that the Pacific Front wouldn't be able to defend them. The Grumble is the Soviet response to the continuously expanding Allied air force, available once Allied technology has been carefully researched by Soviet spies. With a set of massive rocket launchers, the Grumble is capable of eliminating any type of aircraft at great ranges when deployed. 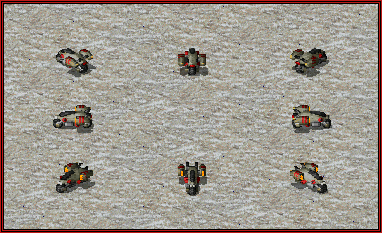 The Grumble has no means of defending itself against ground targets so it requires support from other units. It also has a minimum range that enemy aircraft can approach and stay safe in so remember to create your Grumble defense line wisely and don't leave any "dead zones". Needs to deploy first to fire. During the late stages of the Second Great War, the Allies were beginning to gain the upper hand over the Soviets. Conventional heavy tanks proved useless in countering the aircraft and nimble tanks of the Allies. Soviet engineers set out to design a truly unstoppable tank, one that could take on any enemy and still remain standing even after the mightiest blow. Unfortunately, the Soviets lost the war before the 'super tank' could be produced. The blue prints for the vehicle were quickly hidden and all prototypes were destroyed to prevent the Allies from gaining any more technological advantages. Once the Soviets were free from Allied occupation though, the idea of a 'super tank' had not been forgotten. Research into the project progressed steadily until the tank was complete and ready to be unleashed from war factories all over the Soviet Union. However, in the end it turned out that the tank, now called the Apocalypse, was not very cost-efficient. 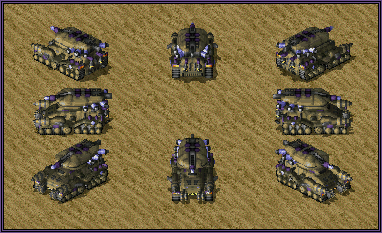 Even with its amazing firepower and reasonable mobility, the modern Tesla Tank proved to be much more effective in battle. Thus the Apocalypse was reluctantly retired. While the Apocalypse can still be found in larger Soviet bases, the tank isn't actively produced. Some Soviet generals still keep a few models around for the nostalgia factor and the symbolic importance of the vehicle. The Apocalypse Tank is equipped with twin 125mm Tesla-enhanced cannons, which are lethal to all armor and structures that might cross its path and the tank's many 'Mammoth Tusk' missile pods make this monstrous war machine a viable threat to aircraft and infantry. The idea of 'throwing everything you have at your opponent' is heavily incorporated in the Apocalypse as it will use all of its weapons at once against the enemy. Due to the incredibly sturdy turret fixated on the hull, the Apocalypse Tank can fire while on the move without losing too much accuracy. 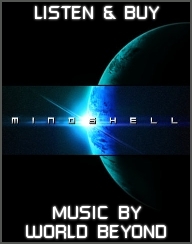 The Syckle is not so much reverse-engineered technology as it is a study of Epsilon's design philosophies and tactics. The Syckle is a marriage of the speed and fragility of Epsilon's tanks with Soviet firepower, creating a vehicle that excels in harassment and chasing down enemy units. 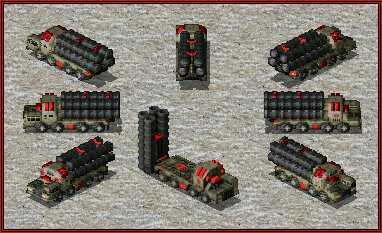 Two powerful rad cannons and one-of-a-kind mobile iron curtain device make the Syckle an almost perennial threat to Epsilon tank divisions and infantry squads and is quite possibly one of the best hit'n'runners out there, especially since it cannot be damaged during the run part of it. But the truth probably is the Soviets wanted to have a cool bike of their own. Deploy to make it invulnerable for 8 seconds, can't fire when it is. A powerful experimental weapon was in development near the border between North and South Korea, where the use of the Iron Curtain Device takes a prominent place in dealing with intruders and performing destructive raids on enemy positions. However, since Yuri has disrupted the peace at the borders completely and left the Korean peninsula in chaos, work on this weapon was delayed until the crew working on it was evacuated and moved deep within China. In cooperation with Yunru's staff somewhere in Kashmir, the Iron Dragon was finalized after many experiments with particle collision technology. 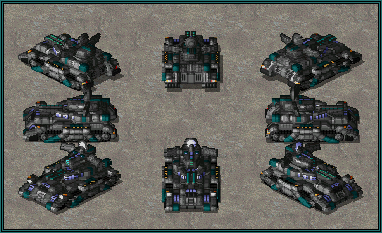 A unit was born that could tear apart tanks in seconds. Needless to say, human flesh does not resist much longer. 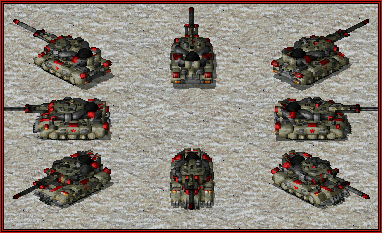 When an Iron Dragon is destroyed, tanks nearby become invulnerable for a few seconds. The exotic combination of the Epsilon's magnetic technology and the Allied weapon adaptation system resulted in the Scavengers appearing in Yuri's tank divisions after the Epsilon forces have successfully raided several Allied bases. This unit's massive size might deceive you into thinking it is bulky and slow, however do not be mistaken as the Scavenger has enough engine power to chase down some of the faster vehicles seen on the battlefield in order to dismantle them using the drain beam that this unit possesses. The drain beam was designed to take enemy vehicles apart and rapidly incorporate their weapon technology into a new custom weapon. With the unleashed talents of an Epsilon technician crew in every Scavenger, it is possible to quickly repurpose the scraps and remains of the destroyed unit's tech into a completely new weapon that the Scavenger will begin using in combat. These new weapons taken from the Epsilon's enemies usually have a twist to them as their engineers are able to come up with adjustments to the technologies acquired with surprising results. A Scavenger can only acquire one weapon and will use it for the remainder of its lifetime. The initial weapon, the drain beam, that the Scavenger uses cannot be fired while the unit is moving, unlike any newly acquired weapon. Minimum range: 1, on all weapons. Ever since Yuri joined the Soviet army, he's been interested in tesla technology. The result of Nikola Tesla's marvellous work has been weaponized and used in the Soviet army ever since the Second Great War and has always been feared by the Allied forces. 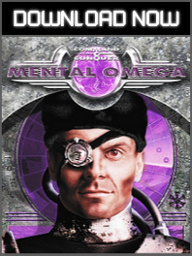 In the early years of his work in Moscow, Yuri was focused on furthering his mind control research. However, as his technology developed and he began to understand more and more about the human mind, he realized that psychic powers can be used for more than just controlling the masses. The Wormqueen is the combined result of psychic and tesla technology. The abilities of Yuri's enhanced psychics can be used to boost the power of even lightning itself, creating a devastating energy weapon. The lightning generated through traditional tesla coils is amplified through the use of psychic tech to give it features considered impossible as the Wormqueen can fire multiple bolts at great ranges and can deal plenty of damage to enemy structures as well. Wormqueen's design is complemented by the use of drills and a sturdy design to give it the ability to travel underground, just like the Driller or the Tyrant. The turret of this tank is equipped with special coils that absorb almost any tesla energy directed at it. These unique features make it an extremely dangerous weapon to encounter on the battlefield. Tesla weapons don't damage it, they heal it instead. Wormqueen's movement can be heard when it's underground. One would think that it should not be necessary to steal some hidden advanced technology from an army quite similar to yours in design, for an aircraft like a Dybbuk with three Epsilon Adepts inside, which can mind control units from the sky, to exist but such is the concept of stolen technology. Dybbuk-Seizer is a Dybbuk with three Epsilon Adepts inside. Brilliant. Can control up to 3 units max. It's a terrifying thought what the Epsilon Army could do if they had full access to the Foehn Revolt's technology. Thanks to the advanced encryption and secret techniques utilized by the Foehn forces, leaking of its intel to the Epsilon is limited, however there have been some successful attempts at reverse engineering this advanced technology. One of the results of reverse engineering is the Salamander, a massive and slow airship which relies on anti-gravity technologies similar to the ones applied to the Basilisks to stay in flight. What makes it different from the Basilisk though is not only its size, but the offensive equipment used in the Salamander. This airship has multiple A.R.O. 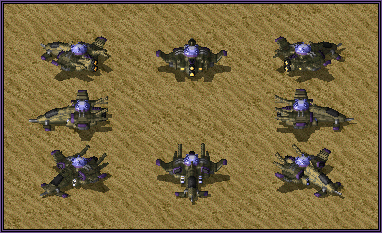 pods at its disposal, making it easy for the Salamander to bombard both enemy ground forces and shoot down enemy aircraft rather quick, due to the massive amount of projectiles it is capable of shooting in a short amount of time. What completes the design is the confusion ray and a confusion field generator mounted on the bottom of the airship. These Foehn technologies are used to disrupt the activity of enemy forces both at a distance and right below the Salamander. To Foehn, the Mirage Tank is one of the technologies lost in the chaos that unfolded during the Battle for Antarctica. Upon finding an Allied Tech Center, chances are that the Clairvoyants will be able to recover this technology. Once that happens, the Phantasm MLRS can be built: a vehicle that fires a volley of powerful projectiles at enemy vehicles and aircraft alike. The Phantasm's other advantage over the Mirage Tank is that it can fire on the move thanks to its rotating turret. Disguises itself as a tree when not moving. The Seitaad Ballista combines two of the most sophisticated technologies from the Soviet and the Foehn workshop: the electromagnetic pulse and the weaponized nanofiber threads. The EMP weapon created for the Seitaad Ballista is more similar to the one unleashed through the Chinese EMP Control Station as it affects enemy units in a small area, making them vulnerable to the attack that comes shortly after: a barrage of sharp and tough nanofiber threads, which are also used for combat by the Last Bastion. These nanofiber threads pierce through all sorts of enemy armor and structures alike. With access to the Epsilon's psychic illusion technology the antithesis of the Shadow Tank has been created by the Foehn scientists: a tank, cloaked that is extremely tough and difficult to break with standard weaponry and, to make things more troublesome for its opponents, amphibious. Contrary to the Shadow Tank, the Archelon's purpose is to withstand as much damage as possible when its location is revealed, not to run away. With its nanoid cannon it devours enemy troops and uses the salvaged material to heal Foehn troops nearby, just like the Huntress does with her smaller-caliber weapon. Unusually resistant to damage from standard cannon weapons. Foehn infantry can briefly heal in nanoclouds created by Archelon's warhead. The Ramwagon is a Neutralizer on tracks and more. 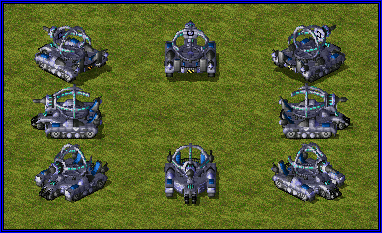 With two large plasma cutters, the Ramwagon can quickly eliminate enemy infrastructure. If any defenses nearby are threatening your forces, a Ramwagon can approach it and use a brute force pulse to shut them down for several seconds. The same effect can be applied to any other powered structure to render it useless. The Ramwagon's unique design and shape allow it to turn almost instantaneously and its speed give it everything it needs to quickly rush into an enemy base, shut down or take down some buildings and drive away. Deploy to disable structures in its vicinity for 20 seconds. Cannot fire its main weapon for 20 seconds after the hack is used.